Signature coaching programs and products are terrific revenue generators. But what if you're a new coach just getting started, or an established coach who's still figuring out your signature method? Are there any other ways to get clients? 1) Focus on gaining visibility in a narrow market. Build a targeted mailing list and be sure to keep in close touch with them. As you build trust and credibility with your list, leave a trail of 'breadcrumbs' back to your coaching services. 2) Have lots of enrollment conversations and get really good at closing the sale. Without signature products and materials, your prospects are faced with a huge gap between your free stuff (public speaking, blogging or whatever you do to keep in touch) and high-end premium coaching. You’re going to need to become a master at facilitating the sales process so you can help them close that gap. 3) Find a position as an ‘in-house’ coach. You could also look for a coaching organization that uses subcontractors or approach a successful competitor (someone working in your niche) and become an associate coach for them. Do you have an innovative way to get coaching clients without products or programs? I'd love to hear about it! (c)Kathy Mallary | SpiritSpring Coaching | All Rights Reserved. Kathy Mallary is a signature coaching strategist in the Seattle, Washington area. She loves partnering with clients on signature projects and helping forward-thinking coaches get more business. When she's not developing knock out signature coaching programs and products with her clients, she enjoys cooking, hanging with her labradoodle, Maxine, and collecting infographics like other women collect shoes. SpiritSpring.com is Kathy's business site. 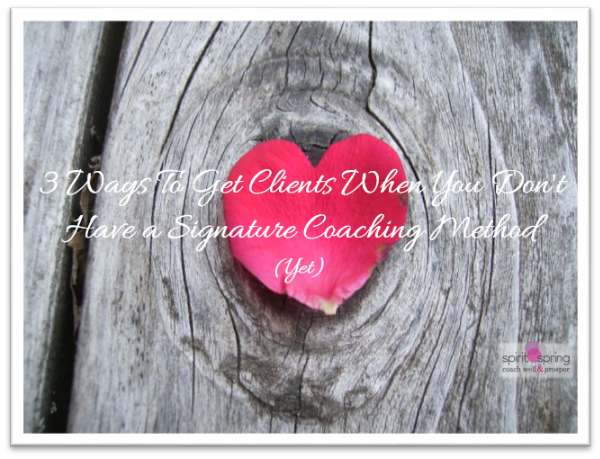 It's full of articles, tools and resources on how self-employed coaches can work better with more clients with a signature coaching approach.